Bundt cakes are everyday cakes—easy to make (using just one pan) and delicious eaten as they are or dressed up with a simple glaze or icing. 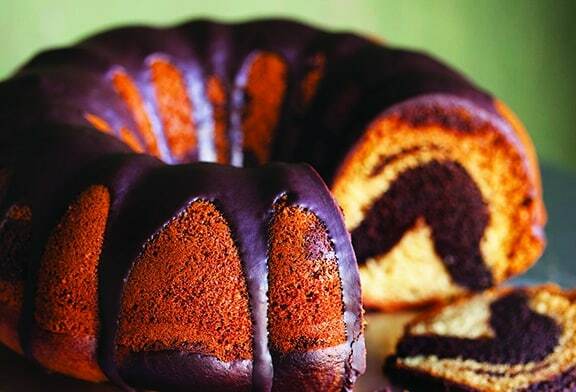 This swirled Bundt cake will satisfy both chocolate-lovers and those who favor vanilla: The two batters meet in the middle and bake, making for a pretty design when you cut and serve it. The addition of a quick chocolate glaze makes it that much more irresistible; to further embellish this cake, serve it with fresh berries or a dollop of nondairy ice cream.From Real Food For Everyone by Ann Gentry, founder of Real Food Daily restaurants in Southern California. Recipe reprinted by permission, © 2015 Andrews McMeel Publishing. Photos by Sara Remington. Bundt cakes are everyday cakes—easy to make (using just one pan) and delicious eaten as they are or dressed up with a simple glaze or icing. Position a rack in the center of the oven and preheat the oven to 325°F. 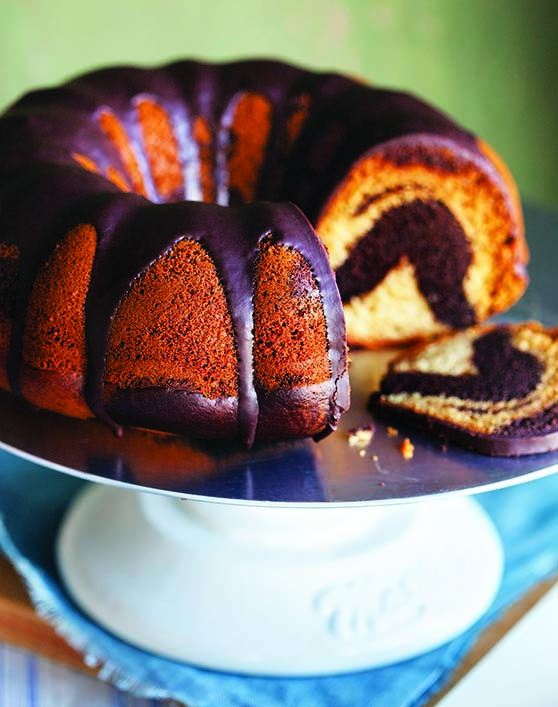 Spray a 9- to 10-inch Bundt cake pan with non-aerosol nonstick cooking spray. Whisk the flour, baking powder, baking soda, and salt in a large bowl to blend. Using a handheld electric mixer, beat the maple syrup, oil, vinegar, and 1½ cups of the soy milk in a large bowl to blend. Add the flour mixture and mix just until blended. Transfer half of the batter to a second bowl. To the first bowl of batter, mix in 1 tablespoon of the vanilla. To the second bowl of batter, mix in the cocoa powder, coffee powder, the remaining ¼ cup soy milk, and the remaining ½ teaspoon vanilla. Pour the chocolate batter into the prepared pan, then pour in the vanilla batter. Do not worry about mixing the 2 batters together to create a marble effect; as the cake bakes, the batters will blend together on their own to create a pretty design. Bake until a toothpick inserted near the center comes out with some crumbs attached, about 50 minutes. For the glaze, stir the chocolate chips in a medium bowl set over a saucepan of simmering water until the chocolate melts completely. Remove the bowl from over the saucepan. Stir in the maple syrup and rice milk. Drizzle the glaze over the cake and let stand until the glaze is set. The glaze looks best the day it is made, so plan to serve the cake the same day you glaze it.